Chronic kidney disease (CKD) patients could present various types of calcifications causing different pathological conditions that would contribute to the renal disease progression and high risk of mortality. Extra-skeletal calcifications represent a common consequence of mineral bone disorders in CKD patients. Vascular calcifications represent a complex systemic manifestation caused by phospho-calcium homeostasis disorders, by imbalance among promoters and inhibitors of calcification and the presence of various arterial diseases and other risk factors. Consequently, vascular calcification can be considered an active pathological process that resembles osteogenesis. Therefore, before starting a suitable therapy for the prevention or delay of vascular calcifications, our recommendations are: to perform lateral abdominal radiography or CT-based techniques in CKD stages 3-5 patients for an early vascular calcification detection, to assess thoroughly patients presenting hyperphosphatemia, hyperparathyroidism, vitamin D deficiency and to understand clearly the pathophysiology of arterial calcification and calciphylaxis. Cellular cannibalism refers to a phenomenon where a living cell is phagocytosed into a tumoral cell, where it eventually dies. With the exception of cells in suspension, cellular cannibalism has only been observed with malignant tumors. The finding of occasional images of cannibalism in our daily biopsies of giant cell tumors of the tendon sheath led us to examine this phenomenon further in a retrospective study of 66 cases from our archives. In each case, four morphological features were evaluated: evidence of giant cells, cannibalism, xanthomatous cells, and hemosiderin deposits. Five cases were randomly selected for further immunohistochemical study with the following antibodies: CD68, vimentin, leukocytary common antigen (LCA), Bcl-2 oncoprotein, p53, caspase-3, and Bax. Patients included 35 (53.03%) females and 31 (46.97%) males. Mean age was 50.73 years (range from 14 to 75 years). Giant cells were found in all cases but one (98.48%). Cannibalism was found in 56 cases (84.34%) and this phenomenon was graded as 1 in 35 cases, 2 in 13 cases, and 3 in six cases. The internalized cells frequently appeared apoptotic. Immunohistochemical analysis revealed that the internalized cells as well as the cannibal cells expressed CD68. The earliest glomerular lesion during the diabetic nephropathy is considered by many authors to be the so-called podocytopathy. Microalbuminuria is an early clinical marker of diabetic nephropathy that results from damages of the glomerular filtration barrier at the level of the highly differentiated podocytes. Thus, the diabetic podocytopathy includes cellular hypertrophy, foot process effacement, detachment from glomerular basement membrane (GBM), and apoptosis. The present paper is reviewing all these features and some additional ultrastructural transformations concerning the podocytes involved in the diabetic kidney disease. Background: In recent years, there has been a growing interest in understanding the pathogenic pathways of premature accelerated atherosclerosis (AS) in systemic lupus erythematosus (SLE). However, the role of both traditional and non-traditional, SLE-specific risk factors is still under debate. Aim: To assess surrogate biomarkers of subclinical AS in SLE and to evaluate potential relations with cardiovascular risk factors. Patients and Methods: Prospective observational study on 35 consecutive SLE women (ACR 1987 diagnostic criteria) evaluated according to a standard protocol including traditional cardiovascular risk factors (hypertension, obesity, diabetes mellitus, cigarette smoking, abnormal lipid metabolism), SLE-specific risk factors (renal disease, SLE activity and duration, corticosteroid therapy) and surrogate biomarkers of subclinical AS (carotid intima-media thickness, plaque) (B-mode color Doppler ultrasound, 7-10 MHz probe). Data were analyzed in SPSS 16 software, p<0.05. Results: Significant differences (p<0.05) among subgroups (with and without plaque, thickened and normal intima) have been registered; moreover, statistical significant correlations between cIMT and age (r=0.476), age at onset (r=0.451), VLDL (r=0.382), hsCRP (r=0.436), Framingham score (r=0.421) have been reported. In addition, significant association between homocysteine and SLE-duration (r=0.460), SLEDAI (r=0.466), SLICC/ACR (r=0.846) has been demonstrated, while hsCRP was associated with ESR (r=0.472), C3 (r=0.396), SLEDAI (r=0.569) and age (r=-0.681). Several predictors for increased cIMT have also been identified (ANOVA): hsCRP (p=0.016), VLDL (p=0.037), Framingham (p=0.012). Conclusions: Our data advocate for increased cardiovascular burden in SLE and support the value of cIMT and carotid plaque as surrogate AS biomarkers in women with SLE. Objective: The purpose of this study was to evaluate the dental and skeletal changes in the maxillary bone morphology, produced by two-arm rapid palatal expansion appliances. Patients and Methods: The study included 22 girls with an average age of 11.9 years treated with RPE appliances at the Department of Pedodontics and Orthodontics, Faculty of Dentistry, Timisoara, Romania. We evaluated the changes on study casts, using an optical 3D scanner - Activity 101 (SmartOptics) and also on radiographs. The level of statistical significance was set by comparing the changes between pre and post treatment values. We also used the Pearson's correlation coefficient (r) to measure the strength of the association between the recorded measurements. The correlations were significant at p<0.05. Results: Significant changes were found in intermolar width change, interpremolar width change, molar tipping and alveolar tipping. Less significant changes were found in molar rotation and palatal depth change. After rapid maxillary expansion, five of the 21 correlations were found to be statistically significant. Positive medium correlations were found between intermolar width change and alveolar tipping and between interpremolar width change and alveolar tipping. A negative medium correlation was found between palatal depth change and alveolar tipping. Weak, but statistically significant correlations were found between intermolar width change and interpremolar width change and between intermolar width change and palatal depth change. No statistically significant correlation was found between the other variables. Conclusions: This type of maxillary expander is capable of expanding the maxillary dentition and alveolar process, opening the midpalatal suture and changing the maxillary bone morphology. The most remarkable changes occurred in the transverse plane. Future research is required to evaluate a larger group of patients. Gastrointestinal stromal tumors (GISTs) are the most common primary mesenchymal neoplasias of the gastrointestinal tract, typically expressing c-kit (CD117) and CD34. Recently, it was reported that nestin and caveolin-1 are also expressed in some human sarcomas, GISTs included. We performed a retrospective study on formalin fixed, paraffin embedded samples from 81 cases of confirmed GISTs, aiming to characterize their immunohistochemical profile, including nestin and caveolin-1 expressions. Tissue samples were evaluated immunohistochemically for CD117, CD34, nestin and caveolin-1. The patients (M:F 36:45), aged 46 to 84 years, had spindle cell type GISTs in 56.7% of cases, epithelioid in 30.8% and mixed pattern in 12.3%. Immunohistochemically, CD117 was positive in 88.9% of GISTs, CD34 in 85.1%, nestin in 77.7% and caveolin-1 in 71.6% of the tumors. Of nine c-kit negative GISTs, 66.7% expressed nestin, the same as caveolin-1 and 44.5% expressed both nestin and caveolin-1. Statistical analysis using Kendall's and Spearman's tests revealed significant correlations between nestin and caveolin-1 expressions (p=0.024). Our results suggest that nestin and caveolin-1 could be considered sensitive markers in GISTs, together with CD117 and CD34, for diagnostic purposes. Their significant expression in CD117 negative GISTs could represent an immunohistochemical alternative in establishing the diagnosis of these tumors. Epidemiological studies suggest that the onset and progression of ovarian cancer are associated with the presence of estrogens. CYP1A1 gene has two polymorphisms, which may affect the estrogens' metabolites and contribute to increased susceptibility to neoplastic transformation of ovarian cells. P53 is a tumor suppressor gene, which acts to preserve stability of human genome. Codon 72 polymorphism of p53 gene was correlated with susceptibility for ovarian cancer. The aim of our study was to validate the use of PCR-RFLP techniques for the evaluation of p53 codon 72 and CYP1A1 gene polymorphisms in relation with ovarian cancer in a Romanian population and to evaluate gene-environment interaction in this context. The case-control study included 42 subjects. The assessment of risk and protective factors was performed using a questionnaire. Polymorphisms of CYP1A1 and p53 genes were assessed using the validated PCR-RFLP techniques. The statistical analysis was performed using Epi Info 3.5.1 software. Frequency of Arg/Arg genotype of p53 gene was higher among cases (43%) compared with controls (33.3%), but the difference was not statistically significant (p=0.75). The presence of Ile/Val polymorphism of CYP1A1 gene was identified in 9.5% of the cases and the MspI polymorphism of CYP1A1 gene was not identified in our subjects. Validation of techniques consisted in the optimization of RFLP methods for p53 and CYP1A1 genes polymorphism analyzing that allowed highlighting the existence of codon 72 polymorphism of p53 gene and Ile/Val polymorphism of CYP1A1 gene in the population from this region. Chronic periodontopathies and diabetes mellitus are two clinical entities, which reciprocally condition one another. The periodontal disease is considered a major complication, which induces an unfavorable evolution of diabetes mellitus. Diabetes mellitus is an endocrine disease which favors the occurrence of periodontopathy through gum's microvascular disorders, the selection and development of an aggressive bacterial plaque and through an exaggerate inflammatory response to the microflora within the oral cavity. Both diabetes mellitus and periodontal disease have an increasing incidence in the whole world. Development of periodontopathy is related to the aggression of bacterial flora in dental plaque, flora that is influenced on its turn by the evolution of diabetes mellitus. In our study, we have evaluated the inflammatory reaction in periodontium in patients with slowly and progressive periodontitis in patients with diabetes mellitus who had diabetes longer than five years. It has been found that all patients presented a chronic inflammatory infiltrate, abundant, with round mononuclear cells of lymphocyte, plasma cells and macrophage type, with non-homogenous arrangement, more intensely where the covering epithelium presented erosions or necrotic areas. Out of the immunity system cells, the most numerous where of T-lymphocytes type. Inflammation of the vascular wall is an essential event in the development of atherosclerosis, the main leukocytes of the inflammatory infiltrate being the monocyte/macrophages. These cells are very heterogeneous and rapidly change their function in response to signals received from the local environment. Purpose: The aim of this research was to study the immunohistochemical expression of the anti-CD68 antibody at the level of the atherosclerotic plaque. Materials and Methods: We used tissue samples obtained by endarterectomies in patients with symptomatic atherosclerotic lesions. Inflammatory reaction was highlighted in the arterial wall by immunohistochemistry using an anti-CD68 monoclonal antibody that marks normal or pathological monocytes/macrophages. Results and Discussion: The types of analyzed atherosclerotic lesions showed a positive reaction with the anti-CD68 antibody, varying in distribution and intensity in the vascular intima. The CD68 was positive in macrophages depending on the extent of the inflammatory reaction. Conclusions: The presence of many macrophages in the atherosclerotic plaques indicates a chronic inflammatory reaction, accompanied by fibroblast proliferation and connective tissue changes that influence the stability of the plaques. Introduction: The growth of solid tumors requires the development of microvessels, therefore tumor expansion depends on angiogenesis. Microvessels provide nutrients and oxygen and remove catabolytic substances, while endothelial cells produce growth factors for tumor cells in a paracrine fashion. The microvascular component of a tumor also plays a role in the metastatic capacity of the tumor, enabling the tumor cells to spread to distant locations by providing a large endothelial surface. Aim: The purpose of this study was to review the literature about angiogenesis regarding malignant lymphomas and to perform basic measurements by means of digital morphometric methods in large B-cell lymphomas and follicular lymphomas. Materials and Methods: After thorough analyzing currently available assessment methods, we performed angiogenesis assessment on 19 randomly selected cases, from paraffin-embedded specimens using digital morphometry. We used immunohistochemistry and the CD34 antigen to mark microvessels. We measured average vascular diameter and a previously successfully applied digital morphometric method to quantify the extent of endothelial area. Results: According to literature data, our knowledge and understanding of angiogenesis grew rapidly from early studies such as Folkman's classic paper. Many studies showed that angiogenesis plays a key role in the biology of tumors and therefore the study of angiogenesis might open new therapeutic possibilities. There have been many studies of angiogenesis in malignant lymphomas, however not as many articles as in other tumor types. Our morphometric studies showed there are statistically significant differences between diffuse large cell lymphoma (DLBCL) and follicular lymphoma (FL) regarding average vascular diameter and that high grade lymphomas tend to have a greater CD34+ endothelial area. Background: There are actually becoming controversial data regarding the profiles of interleukin-17 (IL-17) in different pathogenical stages of rheumatoid arthritis (RA). Objectives: To assessing the IL-17 patterns in synovium, serum and synovial fluid from treatment-naive early RA patients and to identifying potential correlations with disease activity markers and with synovial histopathological profile. Materials and Methods: Serum samples from 30 treatment-naive early RA patients were evaluated for C-reactive protein (CRP), erythrocytes sedimentation rate (ESR), rheumatoid factor (RF), anti-cyclic citrullinated peptide antibodies (anti-CCP). IL-17A levels were also assessed in serum and synovial fluid (SF). Disease activity score (DAS28) calculation was done for all patients. Control serum and SF samples were obtained from 29 patients with osteoarthritis (OA); control synovium specimens were obtained from eight patients with OA and during surgery for knee tear ligaments. Histopathological (Hp) score, immunohistochemical reactivity for IL-17 were also assessed in synovium of early RA patients and controls. Dependencies between serum and synovial profile of IL-17A and the other parameters were statistically tested. Results: In early RA patients, strong correlations of serum and SF IL-17A levels were found with ESR, CRP, RF, anti-CCP, Hp score and IL-17 synovial immunoreactivity; a good correlation was noted with DAS28 score. Also, strong correlation was noted between serum and SF IL-17A levels. Conclusions: In early stages of untreated RA, simultaneous IL-17 assessment of serum, SF and synovium might be valuable in defining activity and predictive patterns, given that synovium is highly suggestive for an disease aggressivity and might express specific therapeutically targets. Starting from the quantification of the specific lesions for chronic hepatitis B and C, our study focused on (i) the correspondence between the necroinflammatory activity and the fibrosis stage ascertained through the Ishak scoring system, (ii) the classification overlaps and differences of Ishak vs. METAVIR score. The study group consisted of 202 cases with chronic hepatitis B and 751 cases with chronic hepatitis C, diagnosed based on liver biopsies. The fragments of hepatic tissue were routinely processed and stained with Hematoxylin-Eosin, trichrome Szekely, Gordon-Sweet silver impregnation, and Periodic Acid-Schiff. A semiquantitative evaluation was performed using the Ishak (for hepatitis B and C) and the METAVIR (for hepatitis C) scoring systems. Our results revealed that the comparison between hepatitis B and C, based on the necroinflammatory activity and fibrosis, is able to offer through the numeric values of the Ishak scoring system accurate proofs, which support the aggressivity of hepatitis C, because it develops fibrosis more quickly, even on the background of mild necroinflammatory activity. Also, our data showed that the necroinflammatory activity and the fibrosis are not processes which progress in a consistent pattern. The application of the METAVIR scoring system for the cases with chronic hepatitis C confirmed that there is not a direct correlation between necroinflammation and fibrosis. The Ishak scoring system provides through the wide range of numeric values attributed for the evaluation of necroinflammatory activity and fibrosis far more precise criteria for the appraisal of the degree of damage to the hepatic parenchyma at the time of the diagnosis. Supplementary, the METAVIR scoring system allows for the hepatitis C an assessment of the entire histologic activity, including the interface hepatitis and the associated lobular necrosis components. The scoring systems have unavoidably strengths and weaknesses, but the choice of a specific one must reflect the consensus between the pathologists and the clinicians, relying on their experience. In this study, we have analyzed clinically, histopathologically and immunohistochemically a total of 34 cases of oral squamous carcinoma in 11 of the cases being identified adjacent epithelial dysplastic lesions. Carcinomas were diagnosed in patients aged 40-60 years, males, with chronic exposure to tobacco and/or alcohol, being located especially on the lips. Well-differentiated carcinomas have been predominant (52.9%) in stage I/II tumoral (88.3%). Immunoexpression analysis of p53, p16 and Ki67 did not reveal statistically significant differences between the expression of markers and clinical or histopathological parameters, except Ki67 whose increased expression was associated to the decrease of the degree of tumoral differentiation and with high degree dysplasia. The positivity index and the intensity of reaction were increased at the level of dysplasic epithelium for p16 and at the level of tumoral invasion front for the p53 and Ki67. The study highlights the value of the immunostain for p16 in identifying dysplasic lesions and predictive importance of p53 and Ki67 markers in identifying the aggressive forms of oral carcinomas. Most adenocarcinomas of the esophagus occur in the area of the cardia and originate in islands of gastrointestinal mucosa, less often in the submucosal glands, and are usually histologically similar to gastric adenocarcinoma and its various histological patterns. Most tumors are well differentiated. All patients included in this study were diagnosed with adenocarcinoma of the esogastric junction through prior endoscopy and histopathological examination of the biopsies. Patients with resectable tumors underwent surgical resection followed by histopathological examination of the resected samples. The most frequently encountered tumor was represented by type III, subcardial adenocarcinoma in 68% of all cases. The main surgical procedure was distal esophagectomy with total gastrectomy extended by abdominal transthoracic approach. All the studied cases were diagnosed with adenocarcinoma of the gastro-esophageal junction. The majority of them were well-differentiated being easily recognized by their submucosal invasion. We believe that surgery with curative intent is superior to curative palliative treatment. Very often, the first doctor who examines a patient with malignant lymphoma is an ENT specialist, because non-Hodgkin lymphoma is five times more frequent than Hodgkin disease in the head and neck region. Approximately 25% of extranodal lymphoma occurs in the head and neck and extranodal presentation is twice as frequent as nodal presentation. This paper present a study of the patients from ENT, Head & Neck Surgery Clinic of Coltea Clinical Hospital, Bucharest, Romania, diagnosed with malignant lymphoma. We developed a specific scheme for collecting data about patients, together with pathology details, immunology and cytogenetic markers. We tried to establish a relation between immunologic and cytogenetic markers and the clinical evolution of non-Hodgkin lymphoma. For this study, we analyzed data regarding CD10, CD5, CD20, Bcl-2, Bcl-6, Ki67 expression obtained from 58 patients with follicular lymphoma. An attempt was made to correlate the presence of certain immunohistochemical and cytogenetic markers with the evolution and aggressiveness of the disease, and we can say that Bcl-2 is positive in all tumor subtypes, being associated relatively frequently with CD5 expression, and is a marker of poor prognosis, while Bcl-6 is positive especially in the tumor forms associated with the predominance of small cells and is a marker of favorable prognosis. The study included a total of 17 ameloblastomas diagnosed in a range of 15 years. Clinical data processing was followed by histopathological and immunohistochemical analysis, following the expression of p53, Bcl-2 and Ki67 in the tumor epithelial compartments. Lesions predominated in the age range 20-40 years, to male gender, being located mainly in the mandible (88.2%). Typical follicular ameloblastoma was present in 70.6% of analyzed tumors. P53 and Bcl-2 immunoexpression was identified especially in the peripheral cells, the number of marked cells being over 50%, while the percentage of positive cells from the stellate reticulum was below 10%. The Ki67 positivity index was below 10% in both compartments. Squamous and granular cells reveal no stain for the investigated markers. Peripheral columnar cells are active compartment of ameloblastomas being involved in the processes of proliferation-apoptosis. Aim: To evaluate the efficiency of laser therapy in healing, regeneration and repair processes located in the superficial periodontium after gingivectomy procedures. Materials and Methods: The study group consisted of 38 patients without any systemic diseases presenting with gingival hypertrophy developed exclusively within the clinical context of gingivitis and/or periodontitis. All patients were included in the study based on their informed consent. All patients required several surgical interventions at the level of the superficial periodontium. Subgroup 1 (17 patients) was treated only through gingivectomy procedures. For subgroup 2 (21 patients), the gingivectomy was associated with laser therapy, applied every day for seven days. Gingival mucosa fragments were taken on day 1 (curative gingivectomy) and on day 21 (clinical control and corrective gingivectomy), and routinely processed for the microscopic exam, using Hematoxylin-Eosin and special stains (trichrome Szekely and Periodic Acid-Schiff). Results and Discussion: The comparison between the morphological pictures characterizing the healing process associated or not with laser therapy, allowed the identification of some features supporting the benefits of laser therapy. We believe that the decrease in the inflammatory infiltrate located in the lamina propria is the critical morphological trait for the control of a healing process as near to restitutio ad integrum as possible. The diminished number of lymphocytes and macrophages will implicitly determine a lower production of chemical mediators interfering with the sequences of the healing process. Conclusions: The morphological differences identified at the gingival epithelium level and subjacent lamina propria support the value of laser therapy, stimulating an improved healing of the damaged tissues. Gait, as an expression of the locomotive system, needs a complex biomechanical analysis, which allows the description of multiple sclerosis (MS) specific patterns, MS patients having a polymorphism of motion patterns. The studied group consisted of 13 MS patients with gait disorders, average age of the group was of 36 years. The evaluation of the subjects comprises: clinical evaluation (anamnesis, neurological examination), paraclinical evaluation (MRI), functional evaluation, neuro-physiologic evaluation and biomechanical evaluation. Biomechanical examination was completed using the force and pressure-measuring platform of plantar pressure distribution Footscan Scientific Version, RSscan. The studied parameters were: contact area, active contact area, heel rotation, foot balance, foot angle. The evaluated zones during a gait cycle were: the heel, medial foot, antefoot. Although the analysis of contact area in the lateral foot did not show any significant differences between the right and the left foot, it nonetheless underlined a major difference in the expression of maximum and minimum values, which meant that MS patients with clinically detectable gait disorders had a tendency to increase contact area to maintain balance. Examining the foot positions in relation to the movement direction and to the foot vertical axis, we noticed the existence of certain elements indicating an orientation tendency of the foot. This tendency had to be related to neutral position (corresponding to anatomical position) of the foot. We also noticed a foot deviation in abduction, associated with visible pronation and decrease of the contact area corresponding to medial plantar zone. Objectives: Immunohistochemical evaluation of the effectiveness of bronchodilator treatment in patients with chronic obstructive pulmonary disease (COPD). Materials and Methods: There have been examined bronchial mucosa biopsies taken endoscopically from 18 patients with obstructive pulmonary disease. The biopsies were fixed in 4% buffered formalin for 24-48 hours and paraffin inclusion was made using the standard technique. For each biopsy, there were performed 10 serial sections with a thickness of 5 micro-m. The sections were stained using morphological, histochemical and immunohistochemical methods. At three of the cases, the paraffin blocks were reconverted for the electron microscopy study, in order to assess subcellular details, with special reference to "target" cells involved in local immune response. Morphohistochemical and immunohistochemical analysis was effectuated on biopsies removed before and after the treatment with bronchodilators. Results: The analysis of the biopsies removed before treatment revealed the following aspects: degenerative alterations of the surface epithelium, loss of ciliary differentiation, absence of caliciform cells, hyperexfoliation, formation of pseudopapillary structures, degenerative lesions of the glands, mucoid and oncocytary metaplasia, stasis in the dilated blood vessels, partly hyalinized wall, multiforme chronic inflammatory infiltrate, myofibroblasts in the depth of lamina propria; argyrophilic basement membrane, fragmentation and lysis of elastic fibers, degranulated mast cells associated with inflammatory infiltrate, with electron-dense typical granules, inflammatory infiltrate with CD20 positive B-lymphocytes, arranged perivasculary and in the vicinity of the basement membrane; rare positive CD4 T-lymphocytes; reduced number of plasma cells. After treatment we found the following aspects: partial or complete regeneration of the covering epithelium, with the presence of cilia cells and occasionally of caliciform cells; remaining myofibroblastic reaction in the lamina propria; increased number of mast cells with minimal or no degranulation; immature, lamelled mast cells. Conclusions: The application of management principles in group therapy study was done by the study which aims to demonstrate the beneficial role in COPD therapy of combining a beta2-agonist with an anticholinergic, obtaining in this way an additional bronchodilator effect, compared with the one obtained by administrating bronchodilators of type beta2 agonists. Deepening the molecular and cellular mechanisms of COPD can lead to more effective methods for early detection of disease, pharmacotherapy targeted and effective conduct exacerbations. As heart development is an incomplete described area, and likewise an important source of intra- and post-partum morbidity and mortality, we have aimed at analyzing both vascular and cytoskeletal factors during early heart development in humans. The distribution of CD105, CD31, alpha-SMA, vimentin and desmin have been studied on a series of normal human heart tissues varying between five and 33 weeks of gestational age, utilizing both enzymatic single immunohistochemistry, as well as double immunofluorescence. We showed here that CD105 is already expressed at five weeks of gestational age in the future endocardium, and that between 9 and 10 weeks it shows clear-cut formed vessels. CD31 was also present diffusely at five weeks in the myocardium, while beginning with seven weeks, endocardium and vessels were clearly positive. Contrary to what it might be expected for striated muscle cells, cardiomyocytes were alpha-SMA positive between 9 and 20 weeks, a time window during which the marker showed clear-cut sarcomer formation. Desmin was first detected at nine weeks lining the cardiomyocyte plasma membrane, and after 17 weeks it showed the adult-like striated pattern of the protein. As expected, vimentin was already present in the mesenchymal cells from the first investigated time point, retaining a perivascular localization only towards higher ages. This is the first study that describes these vascular, muscular and mesenchymal factors on a large series of sequential human tissues, in an attempt to shed more light on the development of heart. Gingival overgrowth is a multifactorial and invalidating condition. Our research is about gingival overgrowth caused by gingival plaque, its purpose being the evaluation of the presence of gingivitis and/or parodontitis in patients with gingival growth and the extent in which there is a connection between gingival overgrowth and the inflammatory process that can contribute to an exceedingly stimulation of the overgrowth. Immunohistological study was conducted on human material - gingival mucosa that came from patients with ages between 20-65 years, divided into three groups: group I - control group, group II - patients with gingivitis, group III - patients with local or general periodontitis. The intensity of immunohistochemical staining of TGF-beta1 and CTGF varies from one group to another, and also depends on the area of gingival mucosa that was observed. TGF-beta1 has a crucial role in periodontal disease fibrogenesis by intensifying the action of CTGF. 22. Comparative analysis of different surgical procedures for female stress urinary incontinence. Is stem cell implantation the future? Rationale: Stress urinary incontinence (SUI) represents a major public health problem and although there are many treatments available, only a few can restore the anatomical background of this disorder. Injections of stem cells into the middle urethra have the possibility of restoring the contractility of the striated muscles and rhabdosphincters. The aim of stem cell therapy is to replace, repair or enhance the biological function of damaged tissue or organs. Objective: Assessing the latest minimally invasive procedures of intra and perisphincterian injection of autologous stem cells and to compare the urodynamic results at one year after different surgical procedures for genuine stress urinary incontinence by measuring their impact on urinary flow rate (Qmax) and bladder pressure at Qmax during micturition. Methods and Results: On October 18, 2010, in "Fundeni" Clinic of Urology and Renal Transplantation we performed for the first time in Romania, stem cell implantation in the urethral sphincter in four patients with stress urinary incontinence and compared the results of the urodynamic investigations of female patients operated with pure SUI with other surgical techniques. The analyzed procedures were: Burch colposuspension (11 cases), TVT-like (IVS sling in 26 cases), TOT-like (CYSTO-SWING sling in 41 cases). Followed variables were: Qmax, Pves at Qmax, postvoiding residual (PVR). Clinical examination and voiding diary in six weeks after the surgery revealed a decrease of urine loss with an improvement of the patient's quality of life according to visual analogue scale. For female patients with myoblasts implant, changes in Qmax and Pves at Qmax were minimal and statistically insignificant in the context of inclusion criteria, but we noticed a trend of minimal change in these urodynamic characteristics, namely, an average decrease of Qmax with 2.1 mL/s and an average increase of Pves at Qmax with 0.6 cmH(2)O. Conclusions: The development of myoblasts implant (if they will pass the time-proof test) could represent a breakthrough in treating this condition. As the pathogenesis of SUI is better understood and the development of tissue engineering technology advances, tissue engineering will play a more important role in the treatment of patients with SUI. Purpose: Immunohistochemical markers are used to classify breast cancer into molecular subtypes biologically and behavior distinct. The Bcl-2 gene has been implicated in a number of cancers and it is also thought to be involved in resistance to conventional cancer treatment. The aim of this study was to investigate apoptosis in breast cancer cells and in molecular groups using IHC expression of Bcl-2. Materials and Methods: Our study included 61 patients that been followed up five years since diagnosis. The traditional prognostic factors: age, tumor size, histological type, histological grade, clinical stage and the status of the lymph nodes were used for primary morphological evaluation. Molecular classification of cases and Bcl-2 assessment was performed by immunohistochemistry in agreement with data from the literature. Results: More than an half of tumors were positive for Bcl-2 showing a favorable response to endocrine therapy. The average age of the patients, hormonal status, tumoral diameter and histological grade showed significant differences statistically. Most of positive cases for Bcl-2 belong to the luminal tumor group, while non-luminal tumors have a negative reaction. When we compared well-known histological types, we noticed insignificant issues regarding score groups for Bcl-2; in exchange, when they were compared into molecular groups, we obtained the strongest statistical correlation. Conclusions: Assessment of apoptosis by Bcl-2 leads to the identification of molecular groups with different immunohistochemical and clinical features and different survival rates, better for Bcl-2 positive tumors and worse in Bcl-2 negative tumors. Introduction: In the present study, we aimed to assess MMP-9 and type IV collagen in the gingival tissue in patients with gingival overgrowth (GO) after orthodontic treatment, with or without clinical signs of inflammation to appreciate the role of balance between those two markers in the onset of GO during tooth movement. Materials: Gingival tissue was harvested from 45 patients divided in three groups: 15 patients with orthodontic appliance that developed GO on at least two teeth; 15 patients with chronic gingivitis with GO; 15 patients (control group) with healthy periodontal tissues, without clinical gingival changes, in whom the first premolar was planned for extraction for orthodontic purposes (canine distalization). Methods: The tissue samples obtained by gingivectomy were fixed in 10% neutral formalin solution for 48 hours and then included in paraffin with the usual technique. The histologic examination was performed using classic Hematoxylin-Eosin technique. Double immunofluorescence was performed for anti-MMP-9 and anti-collagen IV antibodies. Results: MMP-9 / collagen IV double stainings showed an increase of fibrosis and inflammation in different degrees. Conclusions: The mechanical stress induced by the orthodontic devices, might be the key players in driving both the inflammation and the fibrotic reaction. We report a rare case of renal tumor - mucinous tubular and spindle cell carcinoma in a 65-year-old man. The tumor, located in the right kidney, was well circumscribed. Microscopically, the tumoral proliferation was composed of cuboidal cells arranged in tubules, with abrupt transition to spindle cell morphology in a myxoid stroma. Because of the favorable prognosis with this type of tumor, mucinous tubular and spindle cell carcinoma must be differentiated from papillary renal cell carcinoma, especially the variant with sarcomatoid dedifferentiation. Pulmonary alveolar lipoproteinosis, described for the first time in 1958 by Rosen SH, Castleman B and Liebow AA, is a rare pathological condition characterized by alveolar accumulation of lipoproteinaceous material. It is the result of macrophages impairment to rid the alveolar spaces of spent surfactant. This condition involves a restrictive function of pulmonary tissue, reflected in gas exchange impairment and respiratory symptoms of variable severity. Until now, about 410 cases have been reported in the literature. From these cases, 90% were represented by primary type of pulmonary alveolar lipoproteinosis. We present the case of 37-year-old male patient admitted in the Department of Internal Medicine, Emergency County Hospital, Constanta, Romania, with progressive exertional dyspnea, dry cough and perioral cyanosis. The clinical symptoms started three months before hospital admission. Based on clinical findings and imaging features, the primary pulmonary alveolar proteinosis diagnosis has been suspected. Uncharacteristic serous aspect of fluid resulting from bronchoalveolar lavage required open lung biopsy. Pathologic examination of pulmonary slice revealed features consistent with the diagnosis of pulmonary alveolar lipoproteinosis associated with emphysematous foci. The peculiarity of this case lies in the association of two pathological conditions, each of them requiring different pathways. Ameloblastic carcinoma is a rare cause of jaw tumors, especially in children. This rare, rapidly growing, malignant tumor of odontogenic origin affects predominantly the mandible and maxilla. Hypercellularity, lack of differentiation, high mitotic index, vascular and neural invasion are its main histological features. Local destruction and distant metastases to the lungs, bones, liver and brain are common in ameloblastic carcinoma. Prognosis is poor, due to its low sensitivity to chemo- and radiotherapy. We report the case of an 8-year-old girl with ameloblastic carcinoma of the left mandible and extensive right pleuro-pulmonary and bone marrow metastases. Biopsies made from the mandibular tumor and lung tumor tissue obtained by bronchoscopy, showed the same histological features, that of ameloblastic carcinoma. Diagnostic and treatment challenges are shown in this uncommon pediatric solid tumor of the jaw. Carboplatin and etoposide treatment showed some therapeutic effect upon the primary tumor, but lung infiltrations were not influenced. Palliative treatment was initiated. Early detection of ameloblastic carcinoma, before massive distant metastases develop would be an option for long-term survival, which can be achieved with radical surgery followed by radiotherapy. Variants on muscles and tendons of the forearm or hand occur frequently in human beings. They are often discovered during educational cadaveric dissections and surgical procedures. Knowledge of such anomalies is necessary to the surgeons in order to avoid possible damage to adjacent muscles' tendons' blood vessels or nerves. Here we describe a rare muscular variant, the extensor indicis brevis originating from the ligaments of the proximal row of dorsal carpal bones. Conjoined oocytes derived from binovular follicles have been suspected to play a role in producing dizygotic twins, mosaicism, tetraploidy or chimeras. 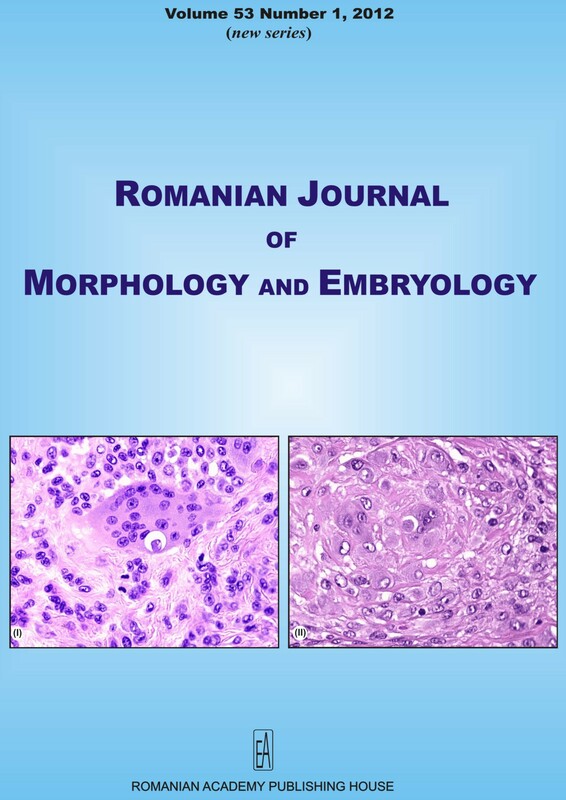 This issue is discussed by presenting three examples for conjoined oocytes observed in our programme of human assisted reproduction and by including a review of corresponding cases. Our material comprises two associated immature oocytes and two cases in which an immature oocyte was attached to a mature oocyte. One of the mature oocytes was fertilized and transferred after cleavage without resulting in pregnancy. In the literature, another fifteen descriptions of conjoined oocytes were found. Here, simultaneous fertilization of both gametes occurred only once and there was no evidence for pregnancies arising from binovular follicles. These data suggest that binovular follicles do not cause dizygotic twins or genetic abnormalities. Association of aggressive jejunal carcinoid tumors and other primary gastrointestinal neoplasms are rarely observed. We describe the case of a synchronous jejunal carcinoid tumor and two colorectal polyps in a 78-year old woman. Surgical intervention was performed for the colorectal tumors and the carcinoid was incidentally found. It was well differentiated but was accompanied by lymph node metastasis and peritoneal carcinomatosis. In this case, the prognosis was not depending by the colorectal tumors but the aggressive feature of jejunal carcinoid lead to patient's death. Mastocytosis comprises a spectrum of disorders characterized by abnormal growth of mast cells (MS). Four entities are recognizable according to WHO classification. Association of systemic mastocytosis (SM) with a chronic myeloproliferative neoplasia (SM-AHNMD) is the second frequently category. Published descriptions of the clinicopathologic features of SM-AHNMD are largely limited to individual case reports. We present the case of a 41-year-old woman with thrombocytosis and mild splenomegaly. Clinical suspicion was of chronic myeloproliferative neoplasia (CMN). Bone marrow trephine biopsy examination (histology and immunohistochemistry for CD117 and CD25) revealed a SM associated with CMN, essential thrombocythemia (ET) type. The JAK2 V617F (for CMN) was detected but KIT / Asp816Val (reported in approx. 80% of SM) was absent. We discussed the particularity of the cases correlated with a review of the literature. We present the case of a female patient, aged 12 years, with fatigability and exertional myalgias, progressively developed within the last two years. Negative family history, as well as negative personal medical history, were found. At physical examination, short stature, proximal muscle weakness and mild hepatomegaly were noted. Urine ketones level was slightly decreased, serum transaminases, creatine kinase and lactate dehydrogenase levels were increased. Electromyographical examination showed a myopathic non-specific pattern. Deltoid muscle biopsy revealed: small, clear vesicles are present on Hematoxylin-Eosin and modified Gomori trichrome stains; modified Gomori trichrome stain also revealed muscle fibers (especially type I of muscle fibers) having mild to moderate mitochondrial proliferation (red rim and speckled sarcoplasm). The lipid storage has been well demonstrated by Sudan Black stain, which revealed small lipid droplets in type I muscle fibers. Abnormal internal architecture with a punctate pattern was showed by adenine dinucleotide tetrazolium reductase and succinate dehydrogenase stains. Electron microscopy showed small inter-myofibrillar accumulations of round, amorphous, homogeneous acellular substances that are not membrane bounded. These features indicate that these are neutral fat (lipid) droplets. Subsarcolemmal accumulations of mitochondria were also revealed. The differential diagnosis of this case is discussed, and the up to date general data concerning carnitine deficiency are presented. The aim of our case-report is to emphasize the role of muscle biopsy in carnitine deficiency, as well as to remind the necessity of keeping in mind such metabolic disorders when doing the differential diagnostic of a muscular weakness.